Cable ties are the fastest way to clean up cable clutter. Rather than having 15 separate cords hanging from your TV, these ties combine multiple cables into a few larger groups. Consider opting for velcro instead of the traditional single-use plastic. They’re a little pricier, but are worth it in the long run as they can be reused. If those are too pricey, try using zip-ties or pipe cleaners. This method requires you to go through the cables you currently have. 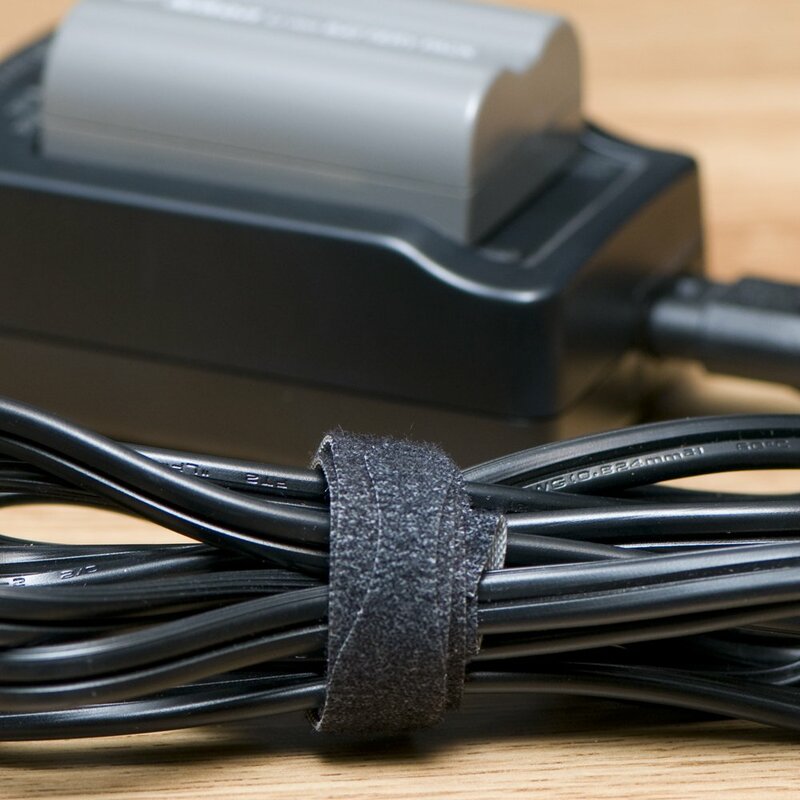 In this process, you might find some unused cables you can give the boot! If you want to go the extra mile, consider replacing your current cables with color-coded ones. Have a red bundle for video-related cables, a blue bundle for audio-related cables and so on. This trick will also allow you to shorten your cables. Most cables come in different size increments. Purchasing the smallest possible reduces clutter, but doesn’t allow for very much wiggle room if you need to move your TV or use it for something else. Pick longer cable lengths, and then coil the excess cable. Use a cable tie to secure the loops. Labeling your cables will prevent any confusion later on. Some cable ties even come with little labels that you can write on for an extra level of organization. If you have the space, get specific. “HDMI” won’t help you in the long run, but “Samsung TV HDMI” sure could help down the line. Mounting the TV on the wall is an easy way to reclaim space. With the TV on the wall instead of a media table, you free up space to tidy up the boxes and cords that rested on or within the table. For a wall-mounted TV, consider drilling holes in the wall to organize those pesky cables. Simply tuck the cables out-of-sight without worrying about them dangling down the wall from the TV. If you live in a rental or are otherwise unable to drill holes in the wall, you can purchase a cord cover at most home improvement stores. These adhere to the wall over your cords and can be painted to match the wall color. Need a cheap alternative? Use a shower curtain rod for similar results. Cord clips are similar to cord ties-- they both hold cables together. 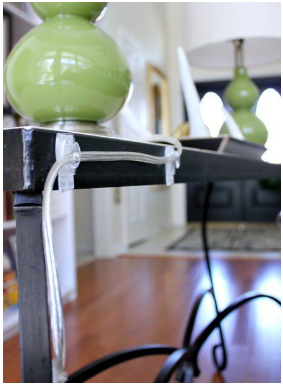 However, cord clips attach to a wall or table to hold cables up, rather than just tied together. Try attaching cord clips to the backside of tables to avoiding sagging cable. 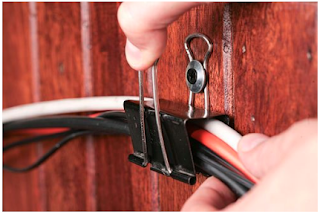 It’s best to place them 12 inches apart and to hang skinnier cords across these clips to prevent cables touching the floor. Still feeling inclined to let those cables drag on the floor? Embrace it! Adjust your baseboards. Many baseboards can be altered to allow for space for cable to be threaded behind them. Disconnect rarely used items. Only use that Wii twice a year when you have your younger cousins over? Pack it away and connect it when you need it. 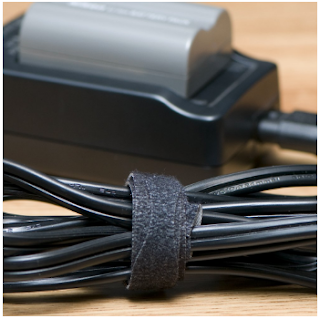 Large binder clips can also be used in a pinch for the same purpose as cord clips. Put a screw with a small washer through one of the handles of the clip and screw it into the table or wall. Then do the same as you would with the cord clips, and thread your cords through. Place extra cables in decorative boxes. Sometimes, the best trick is to hide your clutter in plain sight! This can also work for things like routers or gaming consoles. Just check to make sure your remotes still work properly while the router or gaming console is in the box. If the box method doesn’t work for your bigger items, use it for your power strip. Simply cut holes in the side and thread the cables through. When in doubt, cover up the cables! Use an over-the-door shoe rack to keep extra cables in storage. Dedicate one pocket for each cable or cable type. Alternatively, use a box with empty paper towel rolls standing straight up inside. Put bundles of cables inside and pack the box away. No more giant and tangled ball of cables in your garage! Cleaning up your cables can seem like a daunting chore. However, breaking it up into smaller tasks will make it more manageable in the long run. Happy decluttering!